As seen in the video above, Baxter can successfully organize five objects with AR tags to their original locations. It can handle edge cases in which objects swap positions. Before moving an object to its destination position, it will check if that position is occupied. If it is occupied, then the robot will first move the blocking object to an unoccupied spot nearby before moving the object to its desired location. In general, the Baxter arms are not as stable compared to Sawyer arm and sometimes make shaky movements. On top of that, because of small errors in the AR tracking and the inverse kinematic solver, on average, the placement of the objects are off from the original location by 0.98 cm, with a standard deviation of 0.9 cm. The robot is able to successfully detect and pick up objects over 90% of the time. Using the convolutional neural network that we trained with our table layout data, we can identify the objects and their locations with very high accuracy ( more than 99 percent). From the visualization of the detection result, we can see that the detected bounding box is almost at the same position as the ground truth bounding box. Here are two examples of our detection results, with the detection results on the left and the ground truth on the right. As it is shown in example 2, Even when the bounding boxes are overlapping with each other, we can also locate the objects with high accuracy. Because our training is developed on our own data and the training data is very specific, the detection results are very good with extremely high precision. 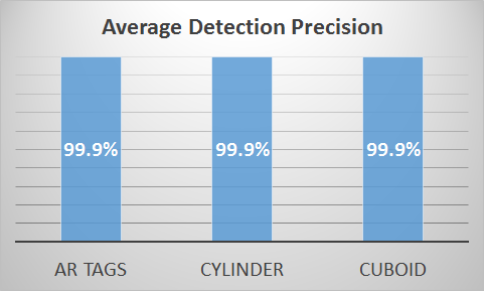 Actually the detection precision on the testing is about 99.9%, which is shown in the figure below. Robotic manipulation without AR tags does not work well. As the robot use the size of the reference AR tag for measurement, it is critical the size of AR tag is accurate. Because of the inaccuracy in the size of reference AR tag, the combination of the two techniques does not work very well. Future improvement could be made on more accurate measure of AR tag size.